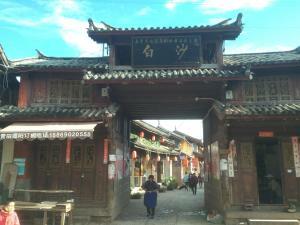 Located in the well-preserved Shuhe Old Town in Lijiang, Sleepy Inn Lijiang features architecture of Naxi minority group. The family-run inn offers free Wi-Fi in the entire inn. 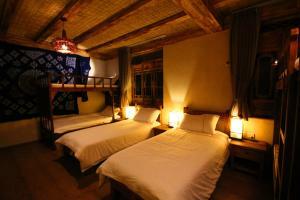 Sleepy Inn Lijiang is a 15-minute drive from Lijiang Old Town and a 1-hour drive from the Jade Dragon Snow Mountain. It takes 30 minutes by car from the inn to the attraction Lashi Lake and 50 minutes to the Lijiang Airport. The inn offers numerous leisure options including a seasonal outdoor pool and horseback riding. The staff at the tour desk can assist with making hiking and cycling arrangements. The elegant rooms come with wooden floor, a work desk and an electric kettle. The bathrooms are fitted with shower facilities, as well as free toiletries and slippers. Guests can enjoy local cuisine at the inn’s restaurant. 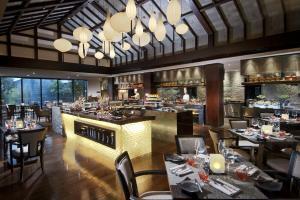 Offering a restaurant, Hilton Garden Inn Lijiang is located in Lijiang. Free WiFi access is available. Each room here will provide you with a TV and air conditioning. Complete with a refrigerator, the dining area also has an electric kettle. Featuring a shower, private bathroom also comes with a hairdryer and free toiletries. Extras include a desk, a safety deposit box and ironing facilities. 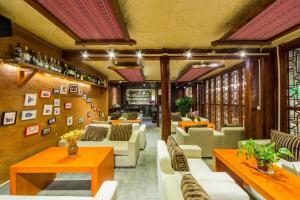 At Hilton Garden Inn Lijiang you will find a 24-hour front desk, a garden and a bar. The property offers free parking. Hilton Garden Inn Lijiang is a 15-minute walk from Lijiang Ancient Town and a 20-minute drive from Lijiang Railway Station. Lijiang Sanyi Airport is a 45-minute drive away. The all day dining restaurant offers Chinese and Western cuisine, as well as snacks. The noodle bar on site serves local Yunnan handmade noodles and rice noodles. Making the traditional modern, the luxurious InterContinental Lijiang Ancient Town Resort presents beautiful Nakhi courtyard architecture, surrounded by lush greenery. Overlooking the Jade Dragon Snow Mountain, it offers a heated indoor pool and pampering spa treatments. Warm colours and wood-beam ceilings give each spacious room an inviting feel. All come with free Wi-Fi, a flat-screen TV and DVD player. The large bathrooms are equipped with a bathtub and separate rainshowers. Located within the hub of Lijiang Ancient Town, InterContinental Lijiang Ancient Town Resort is only a 10-minute walk from Sifang Street and 1.9 miles from Black Dragon Pool. 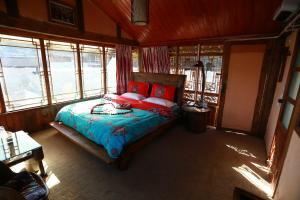 It is a 30-minute drive from Lijiang Sanyi International Airport. To soothe the muscles and lift the spirits, the Tea Tree Spa provides a peaceful sanctuary to enjoy a massage or facial. Guests can also exercise with a personal trainer at the gym, or arrange sightseeing trips at the tour desk. Computer rentals and a business centre are available. The on-site 7 Colours Chinese Restaurant showcases a traditional Chinese or continental breakfast. The specialties of Lijiang like small-pot rice noodles and yogurt made from yak milk are served here as well. In 7 Colours guests can also savour autentic Yunnan cuisine paired with local teas as well as Cantonese and Sichuan dishes while an international menu including Asian and Western cuisines is available in the Basil Leaf Restaurant. Light bites, cigars and wines can be enjoyed in the Club InterContinental. Set in Lijiang, 450 yards from Fang Guoyu's Former Residence and a 6-minute walk from Nanmen Bridge, Hua Long Yuan Boutique Hotel offers accommodation with free WiFi and a garden. 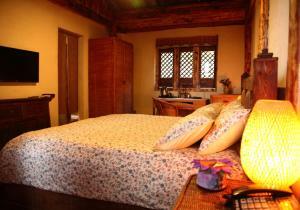 The homestay offers a TV and a private bathroom with free toiletries, a hair dryer and bidet. All units are air conditioned and include a seating and/or dining area. A buffet breakfast is available each morning at the property. Hua Long Yuan Boutique Hotel offers a terrace. A bicycle rental service is available at this property. Guan Men Kou is 750 yards from the accommodation, while Baisui Bridge is a 9-minute walk from the property. The nearest airport is Lijiang Sanyi, 13.7 miles from Hua Long Yuan Boutique Hotel, and the property offers a free shuttle service. Only a 4-minute drive from Lijiang Terminal Station, Lijiang Xi Yuan Xi Exquisite Hostel feature accommodation with free Wi-Fi. It offers a tour desk, a 24-hour front desk, a library, an on-site restaurant and many guest services. It is a 10-miniute walk from Mufu. 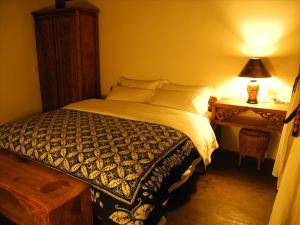 Lijiang Xi Yuan Xi Exquisite Hostel is a 19-minute drive from Square Street or Lijiang Railway Station. Sanyi Airport is about 44 minutes' drive away. Decorated in shades of apricot, all units offer lovely garden views. They come with a flat-screen TV, a fridge, an electric kettle, a work desk and a wardrobe. The en suite bathrooms have soft bathrobes, a hairdryer and shower facilities. Guests can make trip plans and book tickets from the tour desk, then rent a car or bike to explore around by themselves. After a day of tours, spending the evening by reading a book in the library seems relaxing. 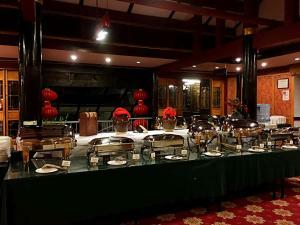 The on-site Chinese restaurant serves Chinese and Western breakfast buffet only. Fruits and candy can be enjoyed at the front desk. 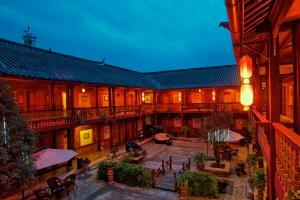 Lijiang Wangfu Hotel is located in the South Gate Square in Old Town. 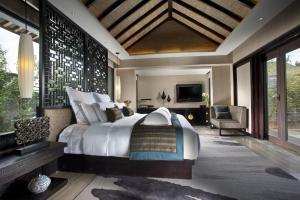 Featuring colorful traditional Chinese architecture and décor, it offers rooms with flat-screen TVs and free internet. Guest can enjoy Naxi bonfire party every Friday. Wangfu Lijiang is a leisurely stroll from Old Town Centre and 17.4 miles from Lijiang Sanyi Aiport. 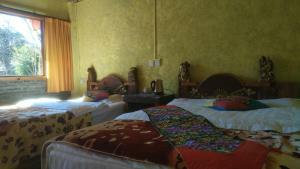 The luxurious rooms at the hotel are fitted with oriental furnishings. Amenities include a minibar and tea/coffee maker. En suite bathrooms come with a bathtub. Bathrobes and slippers are also provided. Guests can sing at the music bar or enjoy a game of table tennis. Indulging in a body massage is another good relaxation option. The hotel provides car rental and concierge services. A tour desk can help with travel and sightseeing arrangements. 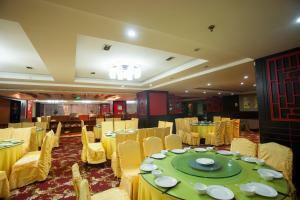 The on-site restaurant serves a variety of traditional Chinese and Western dishes. Offering a restaurant, the artistically decorated Midie Xiang Inn is located in Lijiang, a 5-minute walk from Shuhe Ancient Town. Free WiFi access and free parking are available in this country house. An outdoor swimming pool is set for work outs. Black Dragon Pool is a 25-minute drive away, while Lashi Sea can be reached in 30 minutes by car from the property. 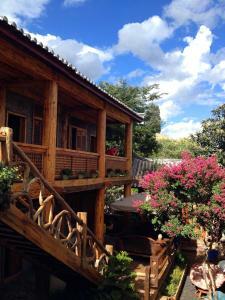 This country house is 50 minutes' car ride from Lijiang Sanyi Airport. The accommodation will provide you with a seating area and satellite TV. There is also an electric kettle. Featuring a shower, private bathroom also comes with a bath or shower and a hairdryer. Extras include a sofa, a fan and cleaning products. At Midie Xiang Inn you will find a garden, a terrace and a shared kitchen. Others offered at the property include grocery deliveries, a shared lounge and ticketing service. Courier Inn Lijiang is located in front of Lion Mountain, overlooking Baita Temple, Yulong Bridge and Wangu Building. The hotel offers free internet access and activities like horse-riding. The air-conditioned guestrooms are equipped with 24-hour hot water, a work desk and hairdryer. A mini-bar and ironing facilities are provided. Room service can also be enjoyed. 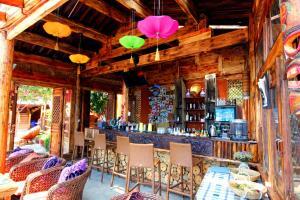 Lijiang Courier Inn features a 50 yards viewing gallery, a coffee shop and a bar. Other facilities include a fitness centre that provides massages and a library where guests can enjoy a good read. Services like laundry, dry cleaning and babysitting are also provided at the hotel. The tour desk organises daily activities and provides car and bicycle rentals. 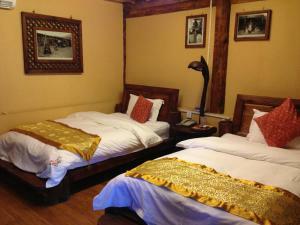 Courier Inn Lijiang is approximately 24.9 miles from Lijiang City Airport. 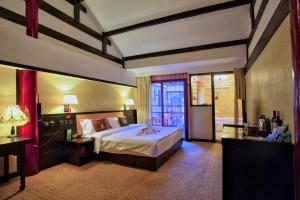 Lijiang Bai Rui vacation hotel is located in Gucheng District, 550 yards from Lijiang Pedestrian Street. The hotel boasts architecture and interiors reflecting the influence from local Naxi and Dongba Culture integrated with contemporary design. Modern rooms offer free WiFi. Lijiang Bai Rui vacation hotel is a 6-minute walk from Square Street while Lijiang Sanyi Airport is a 30-minute drive away. Cosy, soundproofed rooms feature splashes of reds and browns, used to exude Oriental charm. A DVD player and flat-screen TV offering cable channels is provided. Tea and coffee making facilities are included. Guests can rent a bicycle to explore the streets of Lijiang, or make arrangements for a guided sightseeing trip at the hotel's tour desk. Laundry and dry cleaning services are available in this hotel. Traditional Chinese meals are served in the restaurant, while room service is also available. 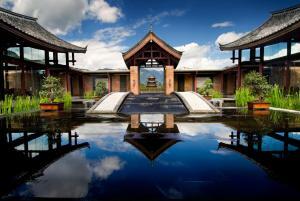 Located in Shuhe Old Town, Lijiang, Banyan Tree offers a relaxing retreat away from the city. Surrounded by fresh mountain air and green landscapes, the property features luxurious accommodation with traditional Naxi-style décor and free Wi-Fi in all areas. Lijiang Banyan Tree is 15 minutes' car ride from Lijiang Dayan Old Town and an 18-minute car drive from Black Dragon Pool. Lashihai Lake can be reached in approximately 30 minutes by car from the property. Lijiang Sanyi Airport is within 50 minutes' reach by taxi. 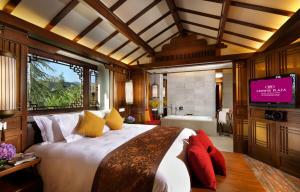 Spacious rooms and villas offer upscale amenities, plush beddings and upholstered seating. 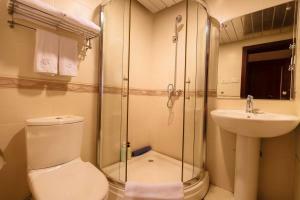 The ample bathrooms include free toiletries and shower facilities. Some rooms feature a jet pool, private swimming pool or private garden. Recreational options on site include spa, a fitness centre and a tennis court. Guests can also spend some quiet reading time in the library, or rent a bicycle to explore the surroundings. Bai Yun Restaurant serves Cantonese, Shanghai and local Yunnan cuisine, while Ming Yue Restaurant has international and local dishes on its menu. Located in Lijiang, 900 yards from White Horse Dragon Pond Temple, Hua Sheng Hotel offers express check-in and check-out and free WiFi. The property is close to several well-known attractions, 900 yards from Wangu Pavilion, 0.6 miles from Three-eye Well and a 13-minute walk from Guangbi Tower. Square Street Dayan Ancient Town is 0.7 miles from the property. Guest rooms are equipped with a flat-screen TV with satellite channels, a kettle, a shower, free toiletries and a desk. The private bathroom is equipped with a hair dryer. All rooms at the hotel include air conditioning and a wardrobe. An Asian breakfast is served daily at the property. Staff at the 24-hour front desk can assist with information about the area. 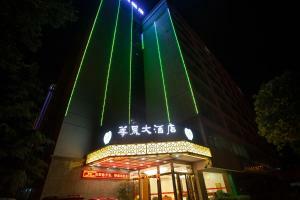 Loyalty Arch is 0.7 miles from Hua Sheng Hotel, while Mufu Palace is 0.7 miles away. The nearest airport is Lijiang Sanyi Airport, 13 miles from the accommodation. With snow-capped mountains as a backdrop, Pullman Lijiang is tastefully designed with a blend of modern and traditional Chinese architecture. Its facilities include a spa. Featuring comfortable sofa, rooms boast scenic views from floor-to-ceiling windows. All units come with under-floor heating, iPod docks and espresso machines. Situated one mile from ShuHe Ancient Town, Pullman Lijiang Resort and Spa is a 10-minute drive from DaYan Ancient Town and downtown Lijiang. It is 21.7 miles from Lijiang Sanyi Airport. For leisure, there is a well-equipped gym and a library. Alternatively, staff can arrange activities like hot air ballooning, paint ball and rock climbing. Added conveniences include free internet access and parking. A variety of international and Asian dishes are served in the beautiful environments of Xi Western restaurant and Zun Chinese Restaurant. Room service is provided. Set in a classic Naxi-style courtyard, Lijiang Qinglu Courtyard Hotel offers accommodation with free Wi-Fi access in Lijiang. It has a nice private garden and sun terrace. Garden views can be enjoyed in all rooms. Featuring traditional interiors and furnishings, rooms here are fitted with wooden flooring, a TV, a seating area with sofa, an electric kettle and a private bathroom. Some rooms also include a private balcony. At Lijiang Qinglu Courtyard Hotel you will find a tour desk. Luggage storage is possible at front desk. Guest can rent a bicycle to cycle around, or enjoy organic vegetables planted in the garden. 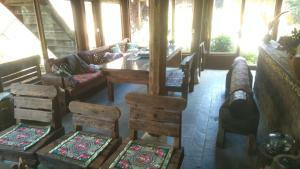 This country house is 19.3 miles from Lijiang Sanyi Airport. 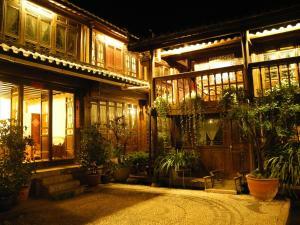 Banshan Huayu Inn is located in the scenic Lijiang Ancient Town, just a 15-minute walk from Sifang Street. 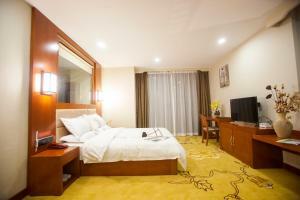 It offers free wired internet in the classic Chinese-style rooms and an on-site Chinese restaurant. Banshan Huayu Inn is a 20-minute walk from Mufu, a tourist site in the old town, and a 20-minute drive from Lijiang Railway Station. Lijiang Sanyi Airport is a 30-minute drive away. 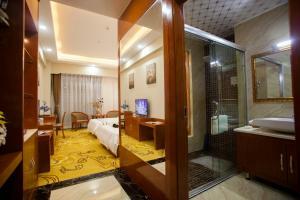 Rooms here will provide you with a flat-screen TV with cable channels. There is also an electric kettle. Featuring showers, private bathrooms also come with a hairdryer and free toiletries. Some rooms offer mountain views and garden views. Extras include a desk. At Banshan Huayu Inn you will find a garden, barbecue facilities and a terrace. Other conveniences offered include shared lounge, a games room and ticketing service. An array of activities can be enjoyed on site or in the surroundings, including hiking and billiards. Situated in the Dayan Old Town district of Lijiang with a garden and a bar, Anyu Dayan Hotel offers accommodation with free WiFi. 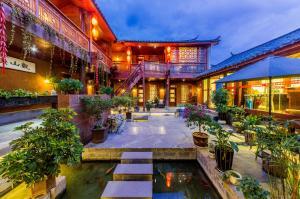 Around 450 yards from Zhongyi Market, the property is also close to Guan Men Kou. The accommodation features a 24-hour front desk, a concierge service and buying tickets for guests. The hotel offers a buffet or à la carte breakfast. 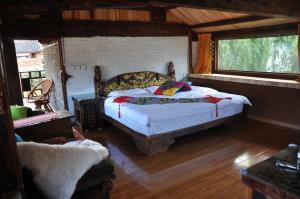 Guests at Anyu Dayan Hotel will be able to enjoy activities in and around Lijiang, like hiking. Nanmen Bridge is a 6-minute walk from the accommodation, while Loyalty Arch is 650 yards away. 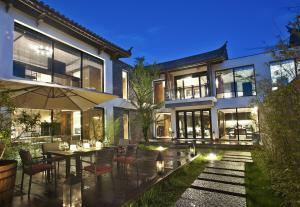 The nearest airport is Lijiang Sanyi Airport, 13 miles from the property. Situated in the Dayan Old Town district of Lijiang with a garden and a bar, Anyu Dayan Hotel offers accommodation with free WiFi. 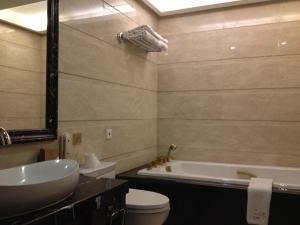 Around 400 metres from Zhongyi Market, the property is also close to Guan Men Kou. The accommodation features a 24-hour front desk, a concierge service and buying tickets for guests. The hotel offers a buffet or à la carte breakfast. 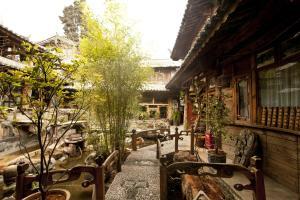 Guests at Anyu Dayan Hotel will be able to enjoy activities in and around Lijiang, like hiking. Nanmen Bridge is a 6-minute walk from the accommodation, while Loyalty Arch is 600 metres away. 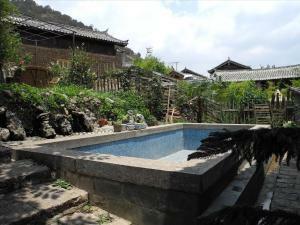 The nearest airport is Lijiang Sanyi Airport, 21 km from the property.